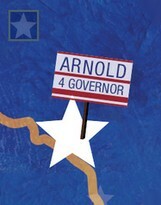 On a late-night talk show in August 2003, Arnold Schwarzenegger announces his candidacy for Governor of California. Two months later, he wins, despite having no qualifications for the job other than playing a hero on screen. 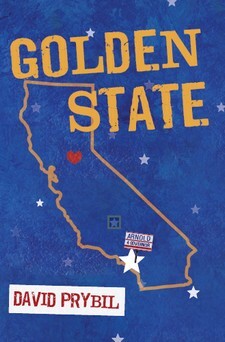 With Arnold's rapid rise to power as a seductive backdrop, GOLDEN STATE follows a disparate quartet of characters in the capital city of Sacramento as they feed off this anything-goes atmosphere and undertake a variety of misbegotten schemes of their own, all in poignant pursuit of this same kind of validation and fulfillment. There is tightly-wound realtor Missy Carver, determined to find Arnold his "Sacramento dream estate" in order to secure the partnership she's certain will make her feel complete; Spencer Brine, a depressed obituarian at the Sacramento Bee, whose star-crossed love for a local stripper provides the inspiration for his unlikely rise through the paper's ranks; widower Todd Tisdale, a former local high school sports star, lost in past glories, whose hopes for saving his struggling tuxedo shop are all pinned on befriending Arnold, no matter what it takes to do so; and finally, Rowena Pickett, a directionless tanning-salon employee who only wants to be loved, even if it's with an Alzheimer's-afflicted mother who can barely remember her name, or a prison inmate pen pal she can't even touch. As these characters' lives cross, often in unexpectedly fateful ways, David Prybil's provocative, darkly humorous work provides a timely meditation on the seamy underbelly of dashed hopes, and the enduring power of the American Dream.